The Curious Incident of the Dog in the Night-Time is a novel by Mark Haddon. It is also a play currently on Broadway in New York City. The show was recently awarded a slew of Tony awards, including Best Play, Best Direction for a Play (Marianne Elliot) Best Scenic Design for a Play (Bunny Christie and Finn Ross), Best Lighting Design of a Play (Paule Constable) one for actor Alex Sharp, for Best Performance by an Actor in a Leading Role in a Play. It was adapted for the stage by Simon Stephens. 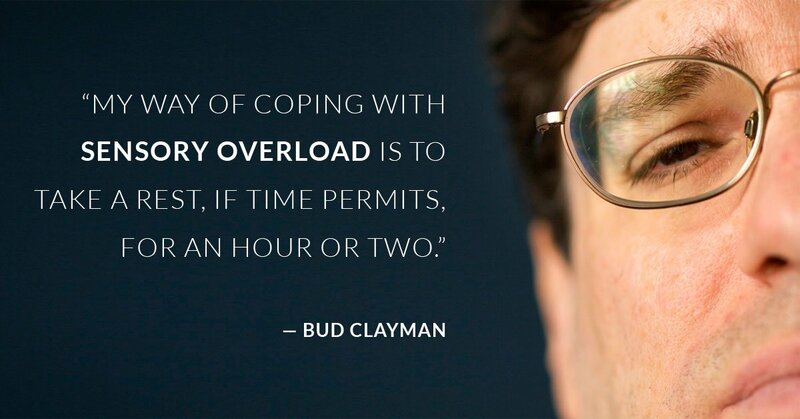 Bud Clayman is the subject (and co-director) of OC87: The Obsessive-Compulsive, Major Depression, Bipolar, Asperger’s Movie. 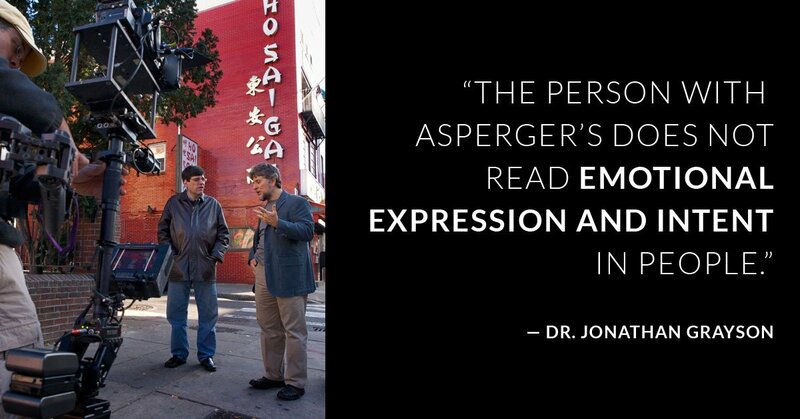 In fact, he was diagnosed with Asperger’s during the filming of the documentary. 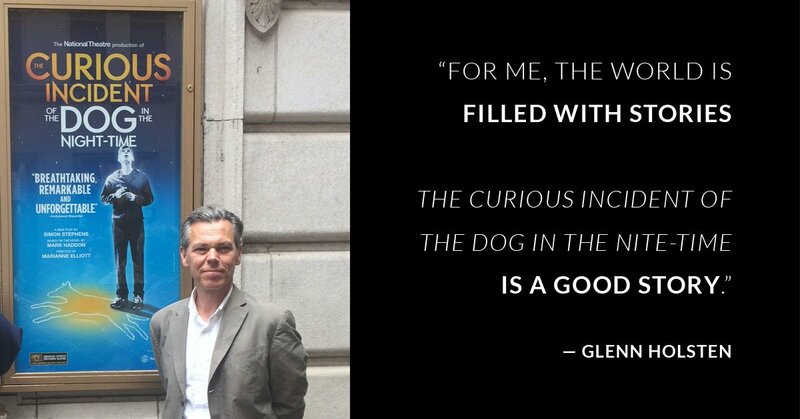 Glenn Holsten is one of the directors of the documentary. 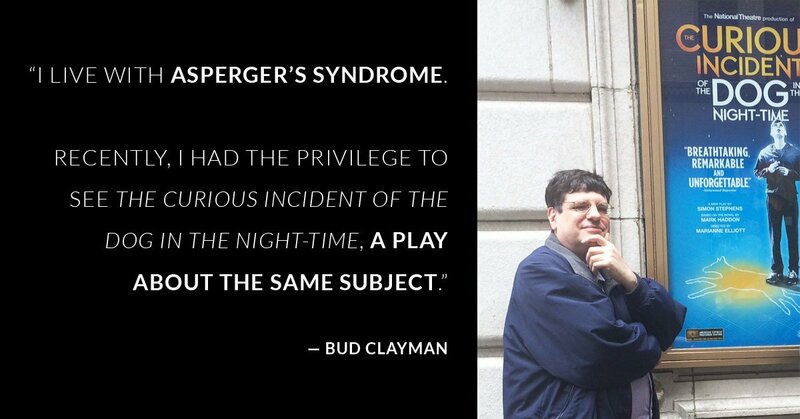 He didn’t know a thing about Asperger’s until he met Bud. Bud and Glenn recently saw the play together. They had two very different experiences. I live with Asperger’s syndrome, which is a neurological and social disorder on the autism spectrum. 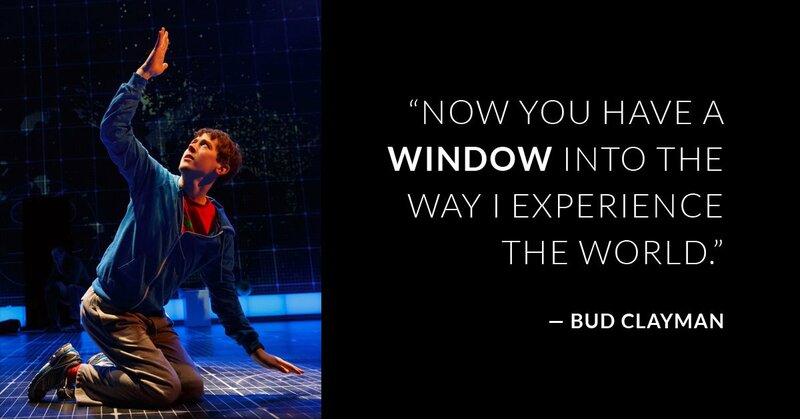 Recently, I had the privilege to see The National Theater’s Broadway production of The Curious Incident of the Dog in the Night-Time, a play about that same subject. The show centers around the character of Christopher Boone, a fifteen-year-old with either Austism or Asperger’s syndrome. It is unspecified. In the opening scene, Christopher finds a dead dog with a pitchfork stuck in its stomach. He becomes a suspect in the dog’s death. In dramatic terms, this event is the inciting incident, the catalyst that propels the play forward and leads Christopher on a journey to find out who really killed the dog and why? ***SPOILER ALERT! IN THE NEXT PARAGRAPH, THE MYSTERY OF THE DOG KILLER IS REVEALED, ALONG WITH OTHER PERTINENT DETAILS ABOUT THE PLOT! Christopher is hell-bent on finding the answer to these questions and by the end of the first act, he discovers that his father killed the dog! For the duration of the play, a horrified Christopher seeks out his mother who he believes is alive even though his father has made claims of her death. Christopher likens himself to Sherlock Holmes and sure enough, he finds his mother, alive. He returns to live with her but by the play’s end, he returns to his father, too, and patches up their relationship. As I write this, I had to re-read the entire 100-page book of the play to summarize the plot. I could not have summarized it even fifteen minutes after seeing the production. My mind kept fluttering in and out of the performance immediately after the opening scene with the dog. The marvelous acting of the ensemble cast, especially Alex Sharp who played Christopher, was the only reason that I could follow the show. Sharp’s mannerisms, especially the way he contorted one of his hands, was typical of somebody on the autism spectrum. The father was also well played by Ian Barford. The razzle dazzle light visuals and the sometimes piercing sound effects were not a problem, as some have suggested they might be for me. The most overwhelming aspect of the production was the storyline. I found it to be an assault on the mind. It was very complex! But is it too complex for most people on the spectrum? I think it depends on the individual. Many children and adults with this disorder are extremely bright so I guess I don’t fall in that category — per se. I have been told I am bright (which I am grateful for) but I would argue that you also need good executive functioning skills to follow this show. You need to have a somewhat organized mind because so much is happening at so many different moments. You also need to be able to quickly pause and say to yourself, “Wait, this part of the show goes here, this is happening for this reason,” and so on and so forth. Even when I read the script, there were so many individual characters and so many lines coming from so many people and I mean letters and numbers and small phrases that I became emotionally winded somewhat and had to put the play down. My mind started to race. I do understand that that might have been the intended effect by the playwright Simon Stephens: to recreate Christopher’s racing mind. But whether this play can effectively reach an audience on the spectrum is another matter. And that does seem to be important. This, then, begs the question of whether the play should have been rendered differently? That is risky dramatically and obviously Stephens took the approach that to recreate the world of someone on the spectrum, he had to duplicate that world for the viewer. The simpler, yet less effective, approach would have been to tell the story from a perspective other than Christopher’s. Another character could have narrated for us their observations of him. But the old dramatic axiom that it is “better to show than to tell” would probably have prevailed here. It is probably better for us as an audience to experience firsthand through Christopher about life with Autism or Asperger’s. What we’re left with then, is an important play that should be reaching out to all people of the population, including those with these types of disorders. This is not a tragic consequence if the play fails to reach that audience but it is also a chance missed. There are many people from that segment of the population who would benefit from a play like this. Perhaps, it could be taught in classrooms for the learning disabled where many on the autism spectrum fall. It could also be required reading for patients who are in therapy for Autism or Asperger’s. After all, Christopher is an excellent role model. He is able to surmount obstacles that elude people without autism spectrum disorders. People on the spectrum, though, should be able to relate to many aspects of the play if they can get past the complexity of it. Christopher has a big problem with sensory overload. I don’t think this is an obstacle that he is able to surmount. Basically, when he is overloaded he groans loudly. If I do that it is infrequent and not in public. My way of coping with sensory overload is to take a rest, if time permits, for an hour or two. I find sleep and just quiet resting to be an incredible restorative technique. Mindfulness also works. As practiced by the founder of MBSR (mindfulness based stress reduction) Jon Kabat Zinn, this technique is usually done in a quiet location and attunes you through a guided meditation to the sensations going through your body, including and most importantly, your breath. I not only suffer from Asperger’s syndrome but obsessive-compulsive disorder, where unwanted intrusive thoughts are quite bothersome. Mindfulness helps me deal with those thoughts by just letting them be there. My body is relaxed enough through the meditations that the thoughts freely pass through my mind without my cognitively grabbing hold of them. I would love to have seen in the play some therapeutic technique used to calm Christopher’s sensory overload. I wish there had been an actual therapist character, but there wasn’t. As I mentioned this play can be an excellent learning tool but again it needs to deliver its message in a more coherent way–at least for those on the spectrum. One of our writers on OC87 Recovery Diaries, Laura Farrell, recently saw the same production but she said it was coherent to her because she read the novel first. Even though she does not suffer from Asperger’s or Autism, she still needed a framework from which to view the show. However, I believe, a show or any piece of artwork should stand on its own and not depend on a guide to hold it up. 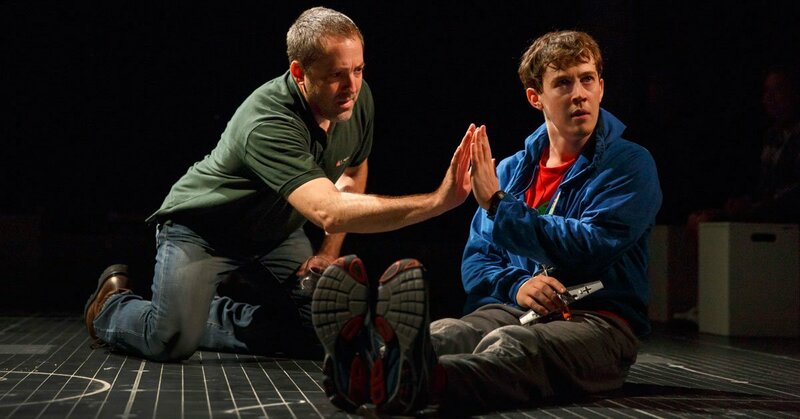 In the end, The Curious Incident of the Dog in the Night-Time is a worthy play to see but beware if you do have an autism spectrum disorder (ASD) or are taking someone else to see it who has an ASD. It may be an overwhelming experience for them. That doesn’t mean that they should be overprotected and shielded, but it does mean that they should come prepared in some way for what is to follow. An idea might be to read the play first or even the novel as our writer Laura Farrell did. I’m tempted to go back and see the show a second time as I feel I would experience it differently. But I’m probably going to let my first time seeing it stand as it is — at least for the foreseeable future. Christopher is an atypical teenage boy. His condition is never stated or defined in the play (or the book, either). However, his physical mannerisms as realized by Alex Sharp (twitching, ever-moving fingers, staccato articulation of words within sentences, an inability to make eye contact), his list-like approach to the world, his remarkable ability to figure out complex mathematical problems, his fear of being touched and his literal interpretation of the many phrases and expressions of the English language, place him “somewhere on the spectrum” in this increasingly familiar world of Autism and Asperger’s syndrome. Learning about a condition from a technical definition is one thing, but for me having it breathe through characters in a film or play is a far more satisfying way of learning about another’s lived experience of the world. 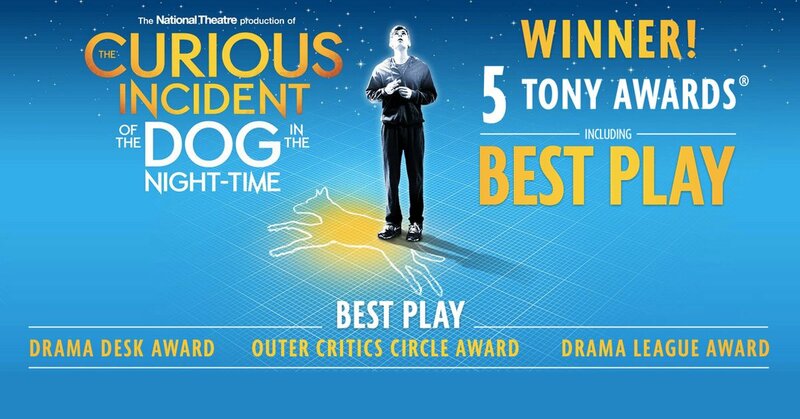 That said, The Curious Incident of the Dog in the Night-Time is not an “Asperger’s” play. It’s a play about a particular family that is trying hard, and stumbling fabulously, to care for a particular boy, named Christopher. First off, it’s a technical wonder. The impressive set stares back at you as you settle in to your seat. A fantastic, flexible set that looks like a giant graph paper cube/Lite Brite combo that transforms with light and color. Designed by Bunny Christie, it’s a template that allows for dramatic lighting and video projections in a limbo-ish, though somewhat mathematical kind of space. Through it, we are at times inside Christopher’s mind, and at other times, outside in the world with him. It changes from a sidewalk chalkboard to an escalator on the London Tube in a flash. Set pieces consist of terrific white cubes that are also multi-functional — becoming chairs, cubbies for stashing props (toy trains), and portable luggage in super clever and imaginative ways. There is fine, fine acting. It’s also a good story. And while I’m not going to recount the entire plot here, we do learn that the challenge of parenting a child like Christopher drives a wedge between his parents. They split up, find temporary solace elsewhere. A dog is killed, and Christopher sets out to discover the dog killer, only to find out some disturbing truths about his own family. It’s also a clever construction. Christopher’s world is revealed to the audience through his comments, but also through his teacher’s voice. His teacher, Siobhan (Francesca Faridany) reads aloud passages from a book that Christopher is writing about his search for the killer of the dog. His writings reveal much about the way he observes and thinks about the world. Christopher says he finds people confusing. Who doesn’t? He’s only honest enough to say so out loud. While math is his forte, parts of language are a mystery to him. Christopher: I find people confusing. This is for two main reasons. The first main reason is that people do a lot of talking without using any words . . . The second main reason is that people often talk using metaphors . . . I think it should be called a lie because a pig is not like a day and people do not have skeletons in their cupboards. And when I try and make a picture out of the phrase in my head it just confuses me because imagining an apple in someone’s eye doesn’t have anything to do with liking someone a lot and it makes you forget what the person was talking about. I have a friend, also named Christopher, who finds such phrases confusing. In fact, the phrase “Let’s hit the road” bothers him because he takes a very literal interpretation of those four words. It’s also a play about a family. A family that is bruised, needs healing, but can’t touch each other. That Christopher doesn’t like to be touched is an understatement. He moans and screams at the most gentle of touches. When he is calm, he does allow his parents to touch his hand, their palm to his palm. That’s it. As a father, I found this to be the emotional center of the play. When we care for another whom we love, part of the “payback” is the physical contact that supports the emotional world. A hug hello, a kiss goodbye, a high-five at moments of great happiness. I really felt the loss for Christopher’s parents when the human reaction is to reach out and hug someone who’s hurting, but Christopher’s fear of touch wouldn’t let them complete that very human action/reaction. Because of this tension, perhaps, one of the most tender moments of the play occurs when a depleted, exhausted and traumatized Christopher has no choice but to allow his father Ed (portrayed by a most excellent Ian Barford) to hold him, undress him and ready him for bed. The quiet fatherly tenderness that Ed is finally allowed to show his son shouts louder than any of the special sound effects that shake the theater at other times during the play. We ache with and for them both. The most powerful part of the play is this — we experience the world through Christopher’s lens. And through his lens, we see ourselves. Voice One 1. I am sitting on a train looking out at a field that is full of grass. Voice Two 2. There are some cows in the field. And it goes on. Passengers on the train reveal their simple digestions of the world around them, and then, quite naturally, their minds wander, so that soon someone is wondering if he “left the gas cooker on” or if “Julie has given birth yet.” It all is recognizable and feels familiar. But not for Christopher. Christopher: But if I am sitting looking out of the window of a train onto the countryside I notice everything. Like . . .
1. There are nineteen cows in the field. Fifteen of which are black and white and four of which are brown and white. 2. There is a village in the distance, which has 31 visible houses. 3. There are ridges in the field. 6. There is a snail. Christopher has a camera eye that notices details. When I first heard this list, I thought about how I try to see when I’m out in the world filming. But I then realized that my goal is to gather these images and arrange them in a certain order to make meaning of a space. I don’t think the same is true for Christopher. For him they are items in a list. One does not have more meaning than another, and collectively, they don’t have any meaning beyond the physical exterior. When I read Christopher’s list of observations, they feel like details from a story that I want to piece together. I want to know where the other Reebok trainer is. How does someone lose a sneaker? Did he or she hop home on one foot? Did it fall out of a gym bag when they were on their way home? And who wrote the grafitti — Jane or Ian? How old were they when wrote the grafitti? Were they out on a date when they decided to document their romance? Are they still in love? Are they happy now? What about the plane — who’s going where? Christopher finally reaches his destination, and in the second half of the play there’s much more confrontation and achievement and other human drama, as Christopher learns more about his place in the world, and those people who care for them, learn about theirs. :: a woman trying to avoid the crowds, pushing a baby stroller dangerously close to traffic. I shrieked. Why is she in such a hurry? Does she realize how close to the taxi her carriage had come? :: a young man and women whispering to each other amidst the crowd. She is crying. Are they breaking up? Has someone died? :: a woman in blue tinted sunglasses sitting by herself in the Starbucks window. She looks right at me. Is she a tourist? A resident? Is she waiting for a friend? Is she lonely? 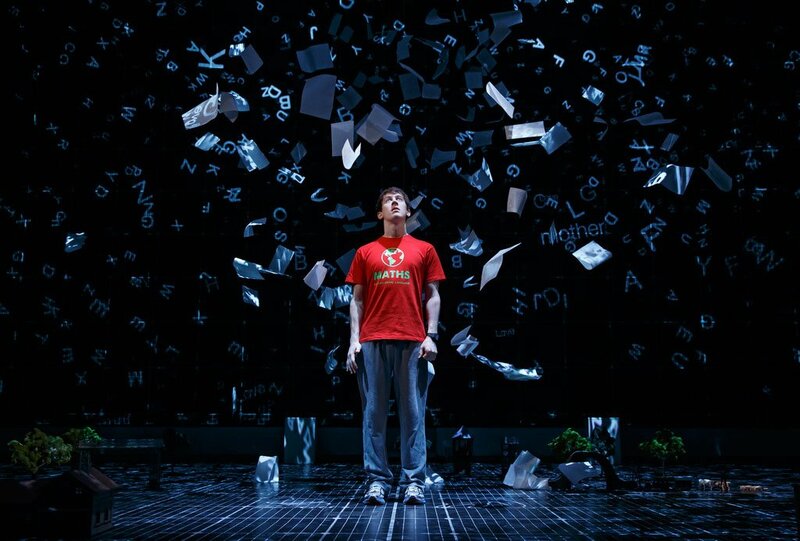 For Christopher, the world is full of numbers and statistics. For me, the world is filled with stories. 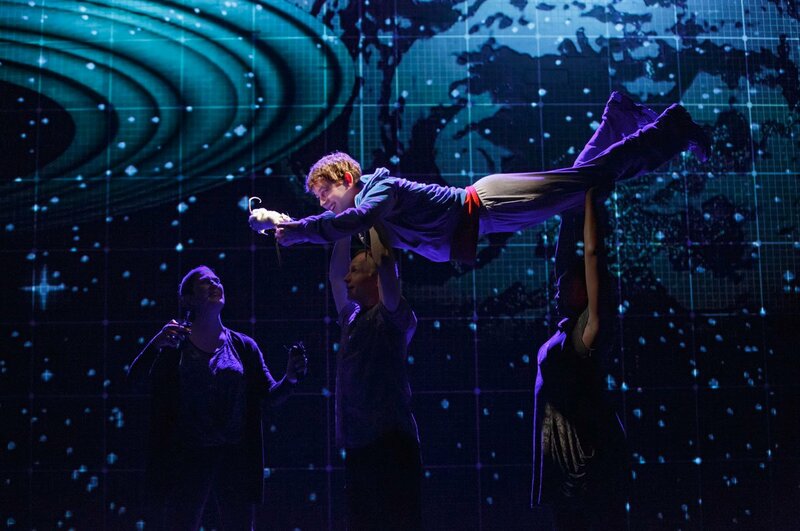 The Curious Incident of the Dog in the Night-Time is a good story. And a very satisfying play.